In the late 19th / early 20th Century, the excavation of Grave 8 at Valsgärde in Uppland, Sweden, (dated to between 635-650 CE.) revealed a lavishly furnished ship grave of a Migration-Age warrior. The grave goods included a splendid helmet, equestrian equipment, mail and a set of splint-armour. No other examples of this kind of armour had been found before or since in Western Europe; how was this equipment worn? The armour had been carefully folded up and placed together in a wooden box in the burial. The meticulous Swedish excavators found a total of 21 iron splints plus fragments of leather straps which had originally held them together and remnants of iron ring-mail. These iron strips fell naturally into three sets of seven, based on the length of the strips and number of straps. Group 1 were the shortest, being between 23.5 - 27.4cm.. long. They had been riveted to two thin leather straps about 1.5cm.. wide, using domed bronze nails. Of the seven, five were broad and tapered, whereas the other two were narrower, with an even width. Each iron strip was angulated upward at the wider end while the narrow end was formed into a dragon-head. The narrow strips are decorated with grooves but the wider ones were plain. Group 2 were between 33-34 cm long and rectangular with a slight taper. Both ends are slightly angulated outward. There were four broad splints which had a pair of lines cut parallel to the edges, alternating with three narrower ones which were again marked with diagonal hatching. At the narrower end were from 2 to 4 holes for rings linking them to some sort of mail structure . Though they all have five matching rows of 2, 3 or 4 bronze rivets, only the top, middle and bottom rows were functional, attaching them to three leather straps (1.2 - 1.6 cm in width). Group 3 is almost identical to Group 2, though slightly longer (35.5 to 36.7 cm) and the system for attaching them to mail differs - the end of each splint is bent over and has notches filed into it, into which the rings are fitted and held in place with wire. I recall visiting the University of Uppsala about 15 years ago and seeing the initial reconstruction of this armour. It had been assembled onto a concrete torso as body armour, with mail on the shoulders and the 14 longer splints hanging down over the chest at the front. The shorter (Group 1) splints had been reconstructed as upper arm armour. It looked wrong then and, on my return home, I was quickly able to demonstrate by reconstruction that the concept was erroneous. The modern accepted interpretation is that Group 1 constitutes a splint * vambrace ** with attached mail hand protection (probably a leather mitten with an extensor mail covering. Group 2 & 3 are reconstructed as splint greaves *** plus possible mail foot protection. My reconstuctions (and many others) have proved beyond doubt that this is practical functional armour. The greaves do not significantly impair mobility and the extra weight on the sword-arm only marginally impairs arm movement. 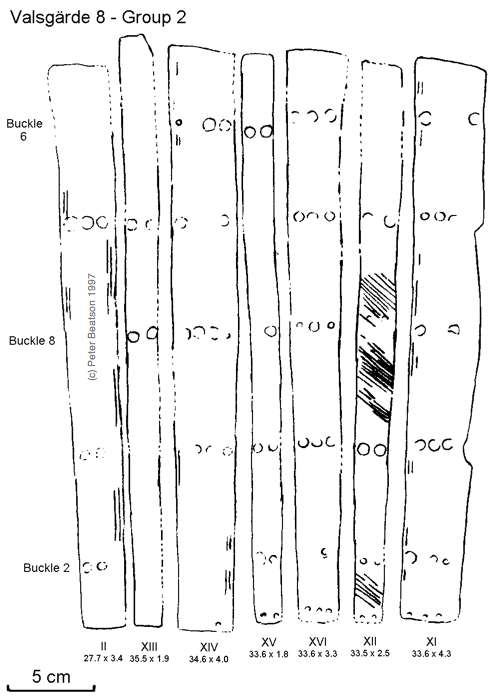 However, there is only this one example of splint-armour limb defences in the archaeological record from Migration-Period Western Europe. Such armour was certainly used in the later Middle-Ages but there is no written evidence of it or clear pictorial evidence. Although often shown in reconstructions of the panoply of Varangian Guards, pictorial, sculptural or literary evidence is lacking. I suspect, that its use has been extrapolated from the Valsgärde 8 find. If we assume that the Varangians fought mainly on foot, their need for lower limb armour would have been limited. The King of the Sviar buried in Grave 8 may well have fought as a cavalryman. Sweden at this time was famous for its horses. The Valsgärde 8 helm, with its full-face mail aventail would make good cavalry equipment. The legs of the mounted warrior are much more exposed than his foot-slogging counterpart, which is why the knight of the Middle-Ages wore first mail chausses and then increasing amounts of plate leg armour. 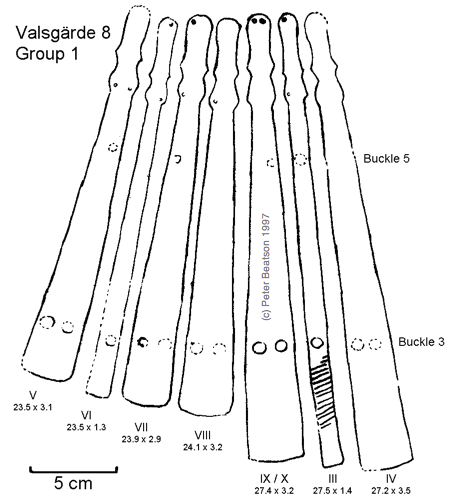 It is thus most reasonable to suppose that the Valsgärde 8 greaves may be unique to these early horse-warriors. The Old English language has preserved two words which are of some help here. Firstly; scancgebeorg. This is literally “shank-protection” (O.E. sceanca "leg, shank, shinbone," from Proto-Germanic skankon from Proto-Indoeuropean base skeng- "crooked") This gives no clue as to the type of armour and could, in theory, relate to splinted greaves. Secondly; scinhosu. This is glossed as ‘greave’ in the Old English dictionary. It is possible that this word relates to the mail chausses, (laced onto the anterior lower leg) which were just coming into fashion by the 11th Century. I have been unable to track down any Old Norse word for greaves and there is no Old English or Old Norse word for vambrace either. We can reconstruct either elnbeorg or earmbeorg by extrapolation from scancgebeorg. Considering the utility of a leather bracer to an archer or to a sword-armed warrior- for even a shallow cut to the critical flexor tendons / muscles of the forearm will render the sword unusable - it is unrealistic to deny that English or Norse warriors utilised some sort of wrist / forearm protection. These may well have been made of organic hard material, such as bone or horn, but examples from the later Medieval period were usually made of hardened leather. * splint : the term is first used of ‘a narrow plate of armour’ circa 1300. It is thought to derive from the Middle Low German splinte - a thin piece of iron. *** greave : name given to plate armour protection for the anterior lower leg. It derives from Old French greve of unknown origin. Arwidsson, G. (1939). Armour of the Vendel period. Acta Archaeologica 10, 31-59. Arwidsson, G. (1954). Valsgärde 8 (Die Gräberfunde von Valsgärde, II). Almqvist & Wiksell: Uppsala. While I do agree the splints may have been for vambraces and greaves, chainmail hand and foot protection seems a little far-fetched to me. Early knights did not use that kind of protection until quite a bit later in their existence. Vendel Scandinavia was in constant trade with the rest of the world, and just as they received the stirrup from this sort of trade, mail protection for the hands and feet would have spread to other cavalry-centric societies and most definitely to knights early on. For example, the Franks, shown to be in constant contact with Scandinavia from as early as Post-Roman Gaul never adopted this form of protection. The Franks formed a large kingdom, which no doubt employed large forces of cavalry. Unless this was the only instance of that kind of armour ever to be used in the period, I have to disagree. P.S. Why would a mail face cover help a horsemen? Thanks for your logical questions. 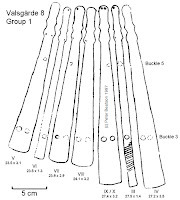 As I implied in my brief article, the interpretation of the Valsgärde 8 panoply was and remains speculative. The diagram of the reconstruction by Engstöm clearly shows the right hand with a mail glove of some sort and a mail strip below the greaves, if not full mail ‘sabatons’. Both the splint vambrace and the greaves from Valsgärde 8 have holes in their distal ends and Arwidsson concludes that this demonstrates mail protection for the sword-hand and the feet, respectively. ‘Iron-gloves’ are mentioned in Snorri’s version of Þórsdrapa in Skáldskaparmál. “Thor lodged with a giantess called Grid who was Vidar the silent's mother. She told Thor the truth about Geirrod, that he was a cunning giant and dangerous to deal with. She lent him a girdle of might and a pair of iron gauntlets, and her staff, called Grid's pole. It must also be noted that the 7th century CE Langobardic cemetery at Castel Trosino, Italy yielded evidence of an ‘armoured gauntlet’. 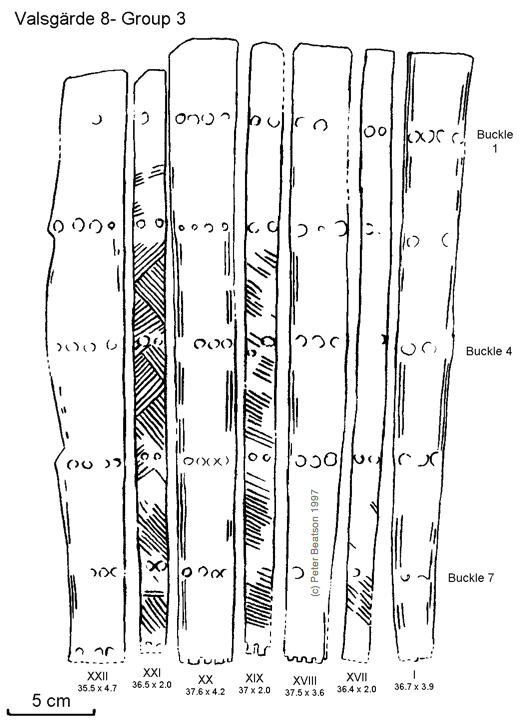 Grave 119 held a lamellar corselet, a helmet and a small (11 x 8cm) rectangle of iron ring-mail, composed of several rows of round section links. This was interpreted as having been attached to the back of a leather glove (which had long since disintegrated). One can thus be certain that mail protection for the dorsal surface of the sword-hand and feet was plausible in the Vendel Age, although probably not too sophisticated or commonplace. I also think the trade links between the Frankish Empire and Vendel Sweden have been overstated. While there are a number of commodities from Vendel-culture archaeolgy which can be traced back to the Frankish Empire, trade in the 6th and early 7th Centuries most likely would have been via intemedaries. There certainly seems not to have been continuity between the two cultures in terms of military technology; there are plenty of examples of gear available in the c7th Frankish territories which did not permiate north. The pagan Vendel Age royal graves demonstrate fairly unique high status heavy cavalry gear designed to impress and intimidate whereas what we know of Frankish armour suggests it was more utilitarian and used for light-medium cavalry. With regard to the utility of the full face aventail and its usefulness to a heavy cavalryman, one must compare the V8 helm with the visored helmets and Great Helms of the early medieval knight. The V8’s closest analogues are, of course, the Parthian cataphract helms from as early as the 2nd century CE. and similar Byzantine equipment but the closest comparison is with the Sassanian clibanarius of the 7th century CE. The rock relief carving of a Sassanian king from Taq-i-Bustan shows him wearing a full aventail crested helm uncannily like the Valsgärde 8. The term klibanophori is usually interpreted as a joking reference to how hot the armour must have been; ‘camp-oven bearers?’ but probably derives from the Persian ‘griva-pana-bara’ meaning ‘neck-guard wearer’. Similar Byzantine helms were said to have double or even triple layers of ‘zabai’ aventails. The spectacle and mail curtain gives excellent protection against missiles and slashing weapons although, as I can personally attest, it does limit vision, although no more than a full visored helm such as a Roman Cavalry ‘Sports’ helmet or the famous Sutton-Hoo Helm. Such restriction to peripheral vision may have been a drawback in the shield-wall but might have been less of a worry on a charging horse. This type of helmet also de-personalises the wearer, giving him a ‘god-like’, inhuman appearance which would most likely have scared ordinary folk considerably. Its psychological effect must have been considerable, perhaps even outweighing its practical benefits. Our articles are intended to encourage academic debate. Any questions, helpful contributions or constructive feedback are welcome. Any comments which are badly written, crude, unhelpful or defamatory will be deleted.